Sunday football was over; it was late afternoon with the temperature having dropped below 20°C. There are few things in these parts that make more sense or come naturally in cold weather than to seek a steaming bowl of lomi – Lipa style, of course. That will mean a staple of thick noodles, bits of meat, thin slices of liver, kikiam and meatballs; plus various little accoutrements, in a manner of speaking, that each lomi haus adds in for variety and to keep an edge over competitors. These do not include, of course, vegetables of any specie. Transients may find these perfectly acceptable served with the lo mien of some fancy mall Chinese restaurant. Locals, however, will give any lomi haus that includes vegetables the kiss of death. So, off we went to the lomi haus; and in this city, there is always one close by. Before long, the steaming bowls arrived; but these were preceded by a brief and totally pointless discussion on the rituals of preparing condiments to accompany the lomi. Herein lays the appeal of the lomi, apart from its being cheap and, therefore, universally appealing to Batangueños. It is like a work of art; but one for which the artist leaves it to the viewer to daub in the finishing touches in a manner that may make it appealing to him. I say pointless because there is stylistically no right or wrong in the way one prepares to eat one’s lomi. It is always a matter of preference, as personal as what one does inside the bathroom or how one grooms one’s self before going to work. The ritual begins, as a matter of fact, as soon as the order is made. There will always be somebody who will make it a point to tell the waiter that his bowl should not have slices of liver. Sometimes, he will take the liver, anyway; but promptly give the slices away as soon as the bowl arrives. In a group, for every person who despises liver, there will always be another who loves it. There will also be those who will ask for no liver but more kikiam, please! Or more meatballs. And not that one’s order is always followed to a tee, especially if the lomi haus is filled with carb-starved customers. When this happens, one is perfectly within his rights to give the waiter a piece of his mind. 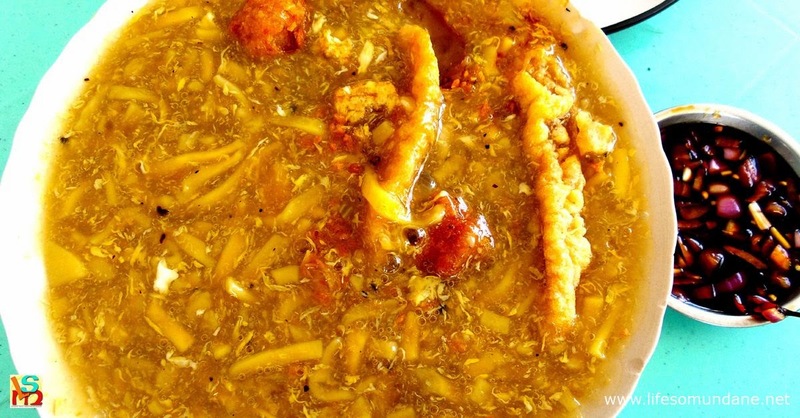 In the old days, one could always tell in a crowded lomi haus who was from the city and who was there just for the day. Locals defiantly preferred to eat from off the bowl, lips probably inured to the heat of the thick steaming broth. Visitors were not so hardy and asked for a plate to transfer the lomi to so it could cool more quickly. These days, even locals have learned to ask for plates. It is a sell out of sorts; but one that has also become a matter not only of preference but also of practicality. There are probably less burnt lips in Lipa these days as a consequence. Preparing the condiments is also a matter of personalised style. On every table already sits a bottle of soy sauce along with a dish filled with red hot chilli. Soon after an order is placed, the waiter arrives with spoons and forks and a small dish with two or three calamansî. One then promptly proceeds to prepare a mixture at the very least of soy sauce and calamansî, which the quick of wit have blended into the word toyomansî. Hot chilli is always an acquired taste; and how many depends on how used to it – or brave – one is. Some will ask for chopped onions, while others are just as fine without these. When the lomi arrives, how one uses the condiments is again a matter of style and preference. There will be those who will pour all of the toyomansî into the bowl and stir vigorously to blend. The process, some say, not only completes the taste of the lomi but also helps to cool down the steaming broth. My own personal preference has always been to pour half of the toyomansî into the bowl and stir; but I also leave enough so I can once in a while spoon drops of it into the broth. This way, the toyomansî comes alive inside my mouth instead of being lost in the broth. Then, there will be those who will pluck the meatballs, kikiam and liver from out of the bowl to let these swim inside the dish and absorb the flavour of the toyomansî. Bits and pieces of these are then spooned into the mouth in between scoops of the lomi’s thick noodles and broth. Of course, what ultimately makes the lomi tastier than it already is will always be the gossip and banter; as indeed, a trip to the lomi haus is as much a social as it is a gastronomic event. Eating lomi alone is fine; but doing so with friends is always better.